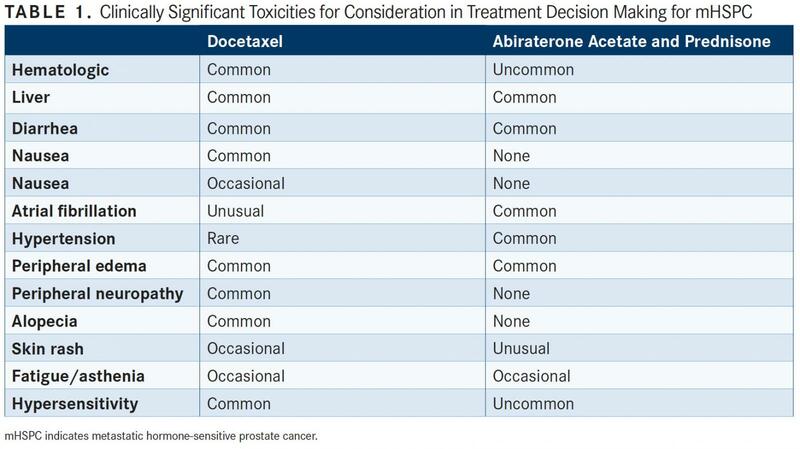 Findings from the CHAARTED, LATITUDE, and STAMPEDE trials1-3 showed various results for adding docetaxel (Taxotere) or abiraterone acetate (Zytiga) to androgen deprivation therapy (ADT) in prostate cancer, and this kicked off a challenging issue for clinicians: Is it better to add docetaxel, abiraterone acetate, both, or neither to their patient’s treatment plan? This is especially challenging considering the heterogeneous nature of prostate cancer and its subtypes. Choosing therapies for patients with metastatic hormone-sensitive prostate cancer (mHSPC) requires careful consideration of each patient’s disease characteristics, comorbidities, treatment-related toxicities, and, to some extent, their preferences, according to Celestia S. Higano, MD. “Historically, the standard of care for mHSPC was, and continues to be, ADT. But now this paradigm is a bit disturbed by the fact that we have the option of adding either docetaxel or abiraterone,” said Higano, professor in the Medical Oncology Division at the University of Washington School of Medicine in Seattle, during a presentation at New York GU™: 11th Annual Interdisciplinary Prostate Cancer Congress® and Other Genitourinary Malignancies. “When we look at [patients with] high-volume disease in CHAARTED, we see this rather dramatic improvement in overall survival with the addition of docetaxel. But in the low-volume disease [group], we didn’t see that, and that was confirmed when they looked at the longer-term follow-up for these patients,” Higano said. Therefore, it seems that docetaxel does not benefit patients with low-volume disease, whereas patients with high-volume disease do benefit. 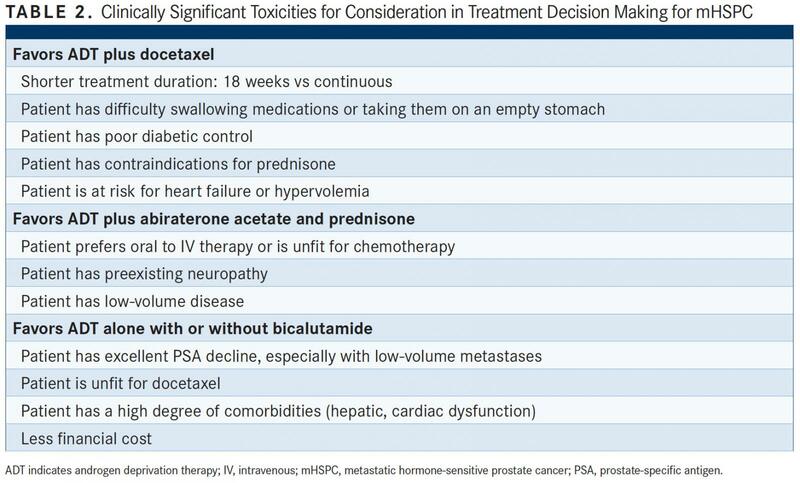 Patients’ responses to ADT alone should also be considered before adding docetaxel and/or abiraterone acetate. In the SWOG 9346 trial, investigators assessed 1134 patients who were being treated with intermittent versus continuous ADT for 8 months. At the 7-month mark, they looked at the patients’ PSA levels and separated them into low, intermediate, and high risk.7 “Those with PSA less than or equal to 0.2 were the lowest-risk group and had a median survival of 75 months, which is dramatically different from those whose PSA [was up to a] 4, whose median survival was 44 months. High risk was those with a PSA over 4, with a median survival of 13 months,” Higano explained. She added that ADT alone is still a viable option for some patients. “If you’re in a situation where you may be wondering if ADT alone may be reasonable for a patient, you may want to give them ADT alone and see where they fall at 6 or 7 months, because at that point it’s not too late to add abiraterone or docetaxel,” Higano recommended. “If they fall into the low-risk group, you might want to consider ADT alone or ADT plus abiraterone, and for intermediate- and high-risk, you could consider ADT with either abiraterone or docetaxel.” She stressed that this was not based on level 1 evidence, but it is how she operates as a clinician. Higano also detailed some other guiding factors for therapy selection in mHSPC (TABLE 2). Looking to the future, no head-to-head trials are set to begin that explore whether docetaxel or abiraterone acetate is a superior agent to add to ADT. However, Higano said, the real question at present is how the use of all of these agents earlier in mHSPC, or even in nonmetastatic castration-resistant disease, will impact subsequent therapies. Sweeney CJ, Chen YH, Carducci M, et al. Chemohormonal therapy in metastatic hormone-sensitive prostate cancer. N Engl J Med. 2015;373(8):737-756. doi: 10.1056/NEJMoa1503747. Fizazi K, Tran N, Fein L, et al; LATITUDE Investigators. Abiraterone plus prednisone in metastatic, castration-sensitive prostate cancer. N Engl J Med. 2017;377(4):352-360. doi: 10.1056/NEJMoa1704174. James ND, Sydes MR, Clarke NW, et al; STAMPEDE investigators. Addition of docetaxel, zoledronic acid, or both to first-line long-term hormone therapy in prostate cancer (STAMPEDE): survival results from an adaptive, multiarm, multistage, platform randomised controlled trial. Lancet. 2016;387(10024):1163- 77. doi: 10.1016/S0140-6736(15)01037-5. 4. Kyriakopoulos CE, Chen YH, Carducci MA, et al. Chemohormonal therapy in metastatic hormone-sensitive prostate cancer: long-term survival analysis of the randomized phase III E3805 CHAARTED trial. J Clin Oncol. 2018;36(11):1080- 1087. doi: 10.1200/JCO.2017.75.3657. Gravis G, Boher JM, Chen YH, et al. Burden of metastatic castrate naïve prostate cancer patients, to identify men more likely to benefit from early docetaxel: further analyses of CHAARTED and GETUG-AFU15 studies [published online February 20, 2018]. Eur Urol. doi: 10.1016/j.eururo.2018.02.001. Francini E, Gray KP, Xie W, et al. Prior therapy and volume of disease are prognostic for metastatic hormone sensitive prostate cancer (mHSPC) in a hospital-based database. J Clin Oncol. 2017;35(suppl 6S; abstr 221). meetinglibrary. asco.org/record/140496/abstract. Hussain M, Tangen CM, Higano C, et al. Absolute prostate-specific antigen value after androgen deprivation is a strong independent predictor of survival in new metastatic prostate cancer: data from Southwest Oncology Group Trial 9346 (INT-0162). J Clin Oncol. 2006;24(24):3984-3990. doi: 10.1200/ JCO.2006.06.4246.